In this post, I will compare two Honeywell smart thermostats. The RTH9585WF and the RTH6580WF and you know what? Well, yeah I know that the RTH9585 is the more beautiful but let’s face it, compared to the Nest 3 or Ecobee4, they both look pretty ugly! First things first, let’s take a look at the difference between the rth9585 and the rth6580. And their differences are very superficial and are related to how they look. The first difference between these two units is their size. And most of that is either plastic casing or buttons. The second related difference is the size of the screen. The screen on the RTH6580 measures about 6.5 inches square. In contrast, the RTH9580 is dominated by its screen which is over 8 inches square. It has no buttons on the front and there is just a narrow bezel on each side. The third difference is that the RTH6580 doesn’t have a color screen- it is only backlit with black numbers on a green background. The 9585 has a “color” screen and all the numbers and letters on the display are in white in an easy to read font. You can choose between six background colors on the screen including; dark blue, red, green or black. Select the background that fits in with your interior decor best! And my fourth difference between these two Honeywell thermostats is that the RTH9585 has a touchscreen, whereas the older model doesn’t. 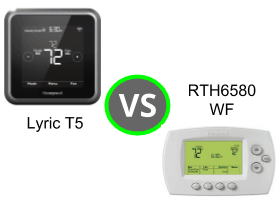 The final difference between these two is that newer thermostat displays a local weather forecast on the unit, whereas the older RTH6580 only display a forecast on the app or on your online account. So now that we I have outlined the major differences, let me explain the ways in which these two thermostats are similar. The first way (and perhaps the best?) in which the 9585WF and the 6580WF are similar is that they both “work with Alexa”. Alexa is Amazon’s digital assistant who is the real power within all Echo devices- Amazon’s range of interactive speakers. You can ask Alexa questions, get her to play your favourite music, read the news out to you and so much more. As time goes by, one of the biggest areas of development is in Alexa’s ability to connect to different smart devices and control them voice command. The two thermostats in this comparison are capable of this. To find out more about how Alexa works with Honeywell thermostats, read this. But Alexa is only one aspect of the home automation capabilities of these thermostats. If you want to know more, take a closer look. The second way in which these two thermostats are similar is that they both work with the same type of HVAC systems. Both the RTH9585WF and the RTH6580WFare designed to be used with 24 Volt systems. They are not designed for use with Millivolt or electric baseboard system. They will work with conventional systems and heat pump systems. In a conventional system, both thermostats provide up to 2 stages of heating and two of cooling. With heat pump systems, this increases to three stages of heating and two stages of cooling. Finally these Honeywell thermostats will work with gas, electric, dual fuel or oil powered (24V) systems. However, if you are still uncertain about whether your system is compatible with these two smart thermostats, or any other Honeywell ones, work through the questions on this page to make sure. The third way in which RTH9585WF and the RTH6580WF are similar is in their scheduling capabilities. Both thermostats come with a preset schedule that you can leave as is or you can create your own schedule. You can schedule up to 4 periods per day, 7 days a week. The next way in which these two Honeywell thermostats are similar can be found in how they are powered. Both of these units need to be connected and powered by a “c” wire or “common” wire. Many modern 24V HVAC systems have a common wire. There is no standardised color coding for C wires and so it is not just as simple as identifying for example a “blue” wire on your system. The purpose of it is to provide modern thermostats with a constant power supply in order to power their larger screens and to make sure that they stay connected to the WiFi network. The good news is that even if your system doesn’t have a c wire, then there are some workarounds. And for more advice about what to do if you haven’t got a c-wire, read this post that I have written. The fifth way in which the RTH9585WF and the RTH6580WF are similar is in the way that they can both be remotely accessed. Both thermostats can be connected via the Honeywell Total Connect app, which is available for your iPhone, iPad or Android device. In order for the Total Connect app to work on your iPhone or iPad, you need iOS 8 or later to be running on the device. If your devices are powered by Android, then the software that your Android gadget needs to be running, varies according to the device. And so the quickest way to find out is to visit the Google Play Store on the device that you want to use and search for “Honeywell Total Connect”. Included in those details will be a message about your device’s compatibility. As if being able to access your thermostat from your smartphone or tablet isn’t enough, they can also be controlled via a free online account that can be accessed via a web browser or a Windows or Mac laptop or desktop. The next way in which these two thermostats are identical is in the way in which they both have a Home/ Away function. Home/ away or geofencing is the ability to use the location of a smartphone in order to turn the thermostat on or off. It requires a virtual boundary (on an online map) to be created somewhere close to where you live and, as you cross this boundary, the thermostat is either turned on or off. And with our busy and hectic lives not having to think about turning a thermostat on and off is incredibly attractive. Unlike with other thermostats, the RTH9585WF and the RTH6580WF cannot do this within the app or via your online account. It is more complicated than that. Instead you need to sign up for another free service called IFTTT and use one of Honeywell’s applets to make this function work. If it all sounds like too much like hard work, then read my Ultimate Guide to IFTTT (link) which will explain it all in simple English. To finish the similarities section, I want to mention a smart features that neither of these two thermostats has and that is smart sensors. Smart sensors are small plastic “buttons” that connect to smart thermostats wirelessly and send information about the temperature of a room in a different part of the house or if that room is occupied. They are making some cutting edge smart thermostats even smarter because they provide lots more information about what the temperature is like throughout the whole house instead of just in the room where the thermostat is placed. The Ecobee4 and the Nest E thermostat can be connected to smart sensors. If you are not particularly bothered by how you smart thermostat looks and whether or not it has a touchscreen, then the RTH6580WF offers a stunning performance at an amazing price.